Copyright © 2009 Ilona L.
these are different specimens (see wings abdomens and heads!). Left - Aclista, right - Cinetus. Whoops, I see the problem--two genera, one specimen. Wing veins are quite interesting. Thanks. I'm hoping that will help in perhaps identifying this wasp. Late in fall these wasps do like the grape jelly. One example of a very slender member of this subfamily of the Diapriidae (Proctotrypoidea). Despite their length, slightly clubbed antennae seemingly lacking the famous "modified segment" at the basis of the flagellum suggest a female. 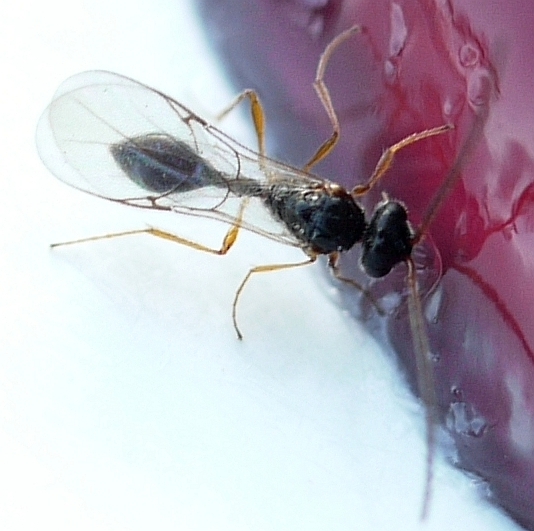 These small wasps are most encountered late in the season, because they develop mainly in mushrooms (as parasitoid of Mycetophilid larvae).